An educated society can reduce the discrimination and stigma associated with mental illness. We work to provide mental health educational opportunities and information to the general public, and to provide specific opportunities and resources to people living with a mental illness, friends and family members of people living with a mental illness, mental health care professionals, high school and post secondary students, educators, policy makers, and law enforcement officers. 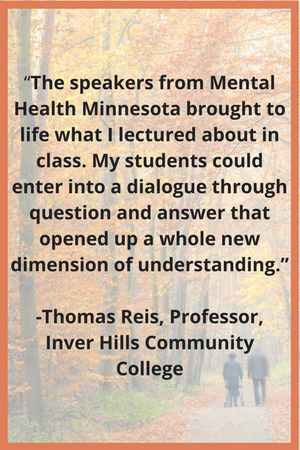 We offer educational presentations to create a greater understanding of mental health and mental illness, treatment options, the mental health system, and the importance of seeking help for mental health concerns. All of our presentations include stories of hope and recovery in order to change attitudes and perceptions of mental illness. To learn more about presentations we offer and to request a presentation, click here. We attend health fairs and events to distribute and share information about mental health, mental illness, our programs, and resources that are available to people who are experiencing mental health concerns. If you’d like to request that Mental Health Minnesota to attend your health fair or event, please contact outreach@mentalhealthmn.org or 651-493-6634. We develop educational materials to promote mental health awareness, recovery, and the importance of early recognition and treatment of symptoms. To request printed materials, click here. Learn more about mental health and mental illness here.